BBC Latest News - Doctor Who - Original Mondasian Cybermen return to Doctor Who! 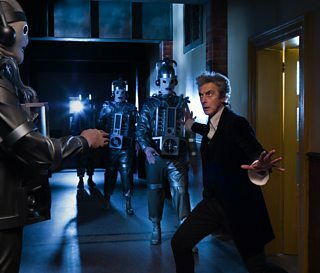 The Doctor (Peter Capaldi) is pictured with the Mondasian Cybermen – the original version of the Doctor’s deadly enemies who hail from the planet Mondas and have not been seen in Doctor Who for over fifty years. The Mondasian Cybermen - Peter Capaldi’s long-time favourite foe - will return in episodes 11 and 12 of the series, alongside Capaldi as the Doctor, Pearl Mackie as Bill Potts, Matt Lucas as Nardole and Michelle Gomez as Missy. The episodes, written by Steven Moffat and directed by Rachel Talalay, are now filming in Cardiff. The new series of Doctor Who begins on BBC One on Saturday 15 April - watch the latest trailer! You can keep up with the latest news by following the official Doctor Who Twitter account, and go behind the scenes with the official access-all-areas Doctor Who Instagram account. Sssssix Cool Facts about the Ice Warriors!